iDE creates income and livelihood opportunities for poor, rural households. | Poor women and men have the right to a secure livelihood. | Markets are the most powerful force for significant, widespread and lasting impact on rural prosperity. | The rural poor are customers, producers and entrepreneurs. | We listen to and learn from the people we work with. | We value innovation and entrepreneurship. | We are results-oriented, aiming for significant impacts for large numbers of people. | We strive for economic, social and environmental equity and sustainability. iDE Canada's first project emerged from Gerry Dyck and Paul Polak’s visit to a refugee camp in Somalia, where Art DeFehr was working as the UN high commissioner for refugees. Their goal was to explore income-generating projects that could help those experiencing poverty earn money. They got to work by asking those living in the camps about their ideas. 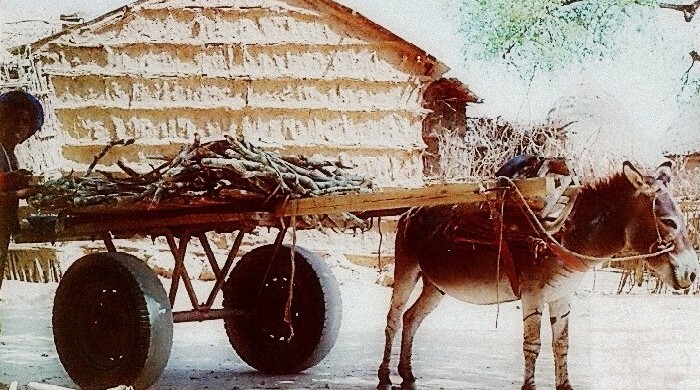 In their research, they noticed refugees carrying supplies on their backs or with inefficient carts pulled by donkeys. The network of camps was also vast and transport between them was almost nonexistent. Using abandoned car parts and working with displaced blacksmiths in the camps, Gerry and Paul modified the donkey cart to make pulling loads easier. Once they had a working model, they set up entrepreneurs inside the camps who created income by renting, building, selling and maintaining the carts. Cart owners purchased on credit. By renting the cart, they could pay back the loan with interest in two and a half months. In total, four hundred carts were sold, producing $1 million of net income for owners in one year. This project set the stage for iDE’s model for development work—listen to people experiencing the problem and give them the tools they need to prosper. This remains the cornerstone of our guiding principles today. iDE’s initial successes demonstrated that entrepreneurs were everywhere, including refugee camps in Somalia. Over the last three decades, iDE has expanded its footprint to engage with local markets. We currently work in 10 countries: Bangladesh, Cambodia, Ethiopia, Ghana, Honduras, Mozambique, Nepal, Nicaragua, Vietnam and Zambia. Everywhere we work, iDE creates business opportunities unique to the communities we serve. Once we start on a project, we commit to staying for as long as it takes to establish businesses that will prosper. Along the way, iDE has learned that the key to market-based solutions to poverty isn’t just about technology; it also requires access to markets, financing, capital and a reliable supply chain. Ultimately, success comes from listening to people and using their input to design tailor-made solutions that meet local contexts: social, cultural, political and environmental. In partnership with iDE offices and country teams around the world, we have served over 30 million people so far.